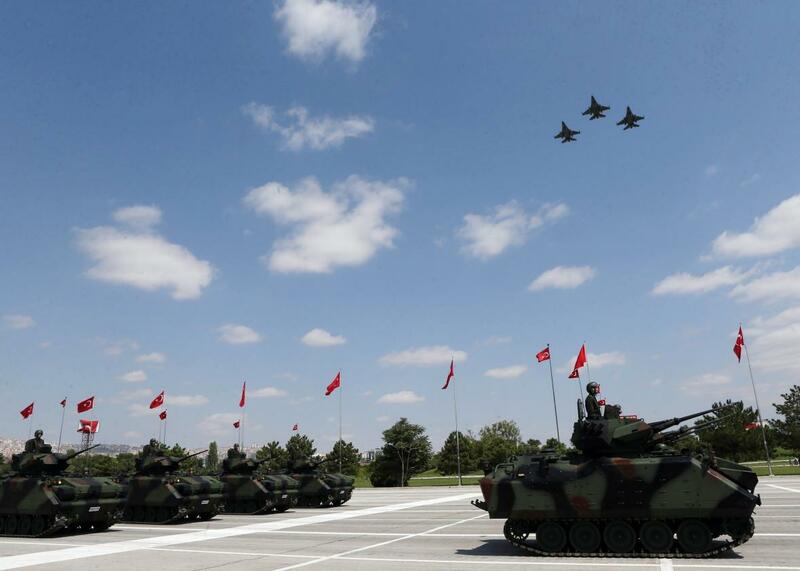 Turkish miltiary jets and tanks during ceremonies marking the 92nd anniversary of the Victory Day on August 30, 2014 in Ankara. U.S. official say that Turkey has agreed to allow U.S. warplanes to carry out airstrikes against ISIS from a base near the Syrian border. The move comes just a few days after a horrific bombing blamed on ISIS in the border town of Suruc that killed 32 people and injured more than 100, prompting widespread anger in Turkey. The Turkish government, which has not yet publicly acknolwedged the new deal, has been pressured by other governments, including the Untied States, and criticized domestically for its reluctance to take a prominent role in the coalition fighting ISIS. Recept Tayyip Erdogan’s government has been more focused on garnering international support to combat Syrian President Bashar al-Assad, and has been wary about supporting the Kurdish rebels against ISIS, which Erdogan alleges are linked to Kurdish separatist rebels in Turkey. Erdogan’s reluctance to provide more help during the Kurdish-led fight against ISIS in the bloody battle of Kobani last year was one factor that led to a dramatic political victory for a Kurdish party at the expense of Erdogan’s AKP in last month’s parliamentary election. Even the taking of 46 Turkish hostages by ISIS didn’t seem to shake the government from its stance, but the massacre at Suruc in addition to recent clashes between ISIS fighters and the Turkish military at the border appear to have finally changed the calculation. Turkey also announced it was dispatching its own jets to the border. An Obama administration official described the Turkey agreement as a “game changer.” That’s likely less in terms of military logistics than politics. While it becomes clearer every month that the fight against ISIS won’t be won by military force, it certainly helps to have all the powers in the area a little bit closer to being on the same page.